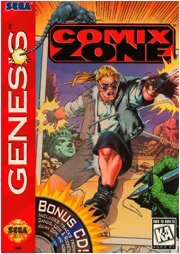 Review: It was a bit late coming to the party, but when it comes to Genesis games, you can’t go wrong with Comix Zone. Imagine for a moment that you are Sketch Turner, a struggling comic book artist. Things are looking kind of “meh” for you until a freak lightning strike releases Mortus, a villain from one of your books. Lucky for you, he can’t kill you because he’s just a drawing, but what he can do is hurl you into said comic book and draw up an army of thugs to take you down. It’s not all bad news, though: now that you’re in the “Comix Zone”, you’re much tougher than in real life. Plus, you know all manner of crazy martial arts moves, which will come in handy as you face off against, among others, robots that shoot exploding springs, women with excessively long hair, and old people with long fingernails. Hearing that, you’d think this game would be all about fighting. Not so. Each level of the game is divided up into panels, not unlike those found on the pages of a real comic book. To move from one panel to the next, you’ll need to complete some goal in the current panel. Early on, it’s usually just a matter of defeating all the enemies in a given panel, but soon, the goals will become more complex, requiring you to solve simple, but dangerous, puzzles in order to move ahead. Often, such puzzles will involve you removing obstacles like explosives, or sometimes just rocks, without injuring yourself too severely. Tricky enough by itself, but while you can break through walls with your bare hands, each hit takes a small portion of your health. And health is in short supply. What this means is that more often than not, the many different set pieces in the game will need to be overcome in a specific way. Early on, there will be some room for error, but it’s do or die late in the game. What’s more, certain situations will require you to hang onto certain items found several panels earlier. Why spend a third of your health ramming through that stack of boulders when the bundle of dynamite you founding the previous panel will do the trick? This is where you have to think about your sidekick: Roadkill. Roadkill is a sewer rat that Sketch keeps as a pet. In the Comix Zone, he has the ability to electrocute anyone he touches, but more importantly, you have to use him in order to solve a number of puzzles, either directly or by scratching up special items hidden in the background. You can deploy him to give you a hand in combat, but if you lose him, you’ll likely find yourself in a world of hurt once you make it to the next non-combat panel. The difficulty is where the game lost a lot of points with players, but in truth, Comix Zone isn’t that much harder than any other game from that era. Many of those games required players to think of a specific course of action in order to beat a given level. Comix Zone just came off as being more difficult because it was presented as more of a brainless beat-‘em-up game rather than a sort of hybrid puzzle-solving/fighting game. Sure, Comix Zone requires some pretty specific action from the players, but it’s part of what keeps the game interesting. Once you’ve got it in mind how to beat the game, it would just be a boring slog if there were no real consequences for slipping up. Plus, like most action games from the 16-bit era, the game can be beaten in around an hour. Sure, you might lose some time getting a game over, but not so much that you would want to hurl a controller across the room. Most of the time. I loved this one. The best part was ripping part of the background off and throwing it at people like a paper airplane. If doing so didn't cost health, I would've done nothing else. This was a pretty fun game, I'm glad they put it on the PSP compilation of classic Genesis games. Even though I loved this game as a kid I have to say it WAS a whole lot harder than most other games that came out back then (and we all know how brutal some of those 8- and 16-bit games could be). I never managed to finish it. The furthest I ever got was the desert/shipyard stage. I remember this, it was awesome. There was no greater feeling in this game than drop-kicking a mutant through a series of panels, watching them shatter/rip in the process. This was the only game released by the Sega Technical Institute, but God-DAMN was it a doozy. This game is awesome. I remember playing it the frist time when it came in a CD full of demos for PC and this was one of my favorite ones. I was able to play the full version sometime later, and I was definitely surprised by how difficult it proved to be. The mere fact that punching and kicking solid objects drained your health made it more realistic, albeit harder, and those iced-tea bottles were pretty rare. The question mark items were not your standard "same surprise every time", as they changed with every play, making its take a real lucky guess. Hell you could be blasted to bits gambling with those things. I also liked the humour of the game. The way Sketch interacts with most enemies while fighting them is unique and I never get tired of listening how the Strigils say "Gimmie the respect I deserve!". Oh and I find level 2 (Welcome to the Temple) the best one in the game. Great graphics and sound. One of my all time favorite Genesis games. I almost managed to beat this one once, but I managed to screw up something with the rocket and the end and didn't want to go through the hassle of replaying. It's a pity this game came out as late as it did. It's another pity that there hasn't been another game like it since. I could never beat that last boss. It would be awesome if you, guys, could create a Pickleman videogame based on Comix Zone... That would be fun and hilarious!